The needs of speech therapy practices are a little different from other ambulatory care medical practices. The physicians dealing with speech issues and disorders are called Speech Therapy Pathologists (SLP). The speech pathologists have a very hectic and tiring routine and they need to automate their routine tasks to streamline their clinical workflow. Like all other specialties, speech therapy physicians want easy access to clinical information, code for optimal reimbursement and compliance with all the regulations relevant to speech therapy. Apart from all these common needs, the speech pathologists have some of their own unique requirements. They have complex documentation needs, and they need to follow the various recommendations by the American Speech-Language-Hearing Association (ASHA). Each practice has its own requirements too. Some need a fully functional Electronic Medical Records (EMR) software and some need a Practice Management (PM) software for clinical operations, while some need both. To cater all these needs, Speech Therapy Pathologists (SLP) across the US have adopted specialty-specific Speech Therapy Electronic Medical Records (EMR) software. Due to a large number of Speech Therapy EHR & PM software in the health records software market, it becomes really confusing to choose an EMR system that meets all your requirements. It is advisable to learn about the different features and functionalities of the software to have a good understanding of how the software works and what it has to offer. It also helps you cut down your list of choices before choosing an Electronic Health Records (EHR) software. SLP need to work with large volumes of data. The EHR software should be able to handle all the extensive documentation. The Speech Therapy EMR Software must include specialty-specific templates. For example, templates for swallowing exams, voice exams, and cognitive communication exams etc. 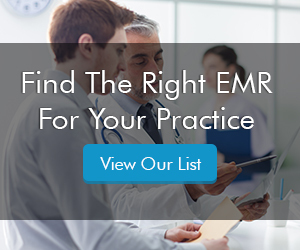 The top EMR software must offer PQRS support. The software should include preloaded G-codes and modifiers to help automate PQRS reporting. Speech Therapy EHR software should have custom lists for lab, procedure, and radiology orders.